US, 2010, 105 minutes, Colour. George Clooney, Irinia Bjorklund, Johan Leysen, Paolo Bonacelli, Thekla Reuten, Violante Placido. Who are all those hitmen that we see in thrillers? Where do they recruit all those security guards that seem to appear out of nowhere when somebody threatens a gangster or a Mafia boss? What do they do when they are not hitting? 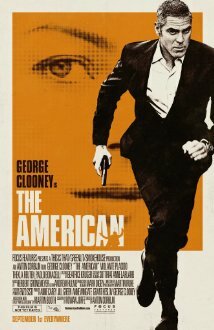 You won’t get answers to all these questions in The American but you will get a portrait of a hitman who is tiring, beginning to form relationships he never dared to form before, but who is trapped by bosses who want him to do one more job. And then he will get out? The boss says yes, but will he? Or will he outwit any threats? But, ultimately, we never learn anything in detail about the hitman’s past. The probing is all in the present. This is a film with strong continental European sensibilities. While there are some action sequences, there are a lot more inaction sequences. Not that these aren’t interesting. Psychologically, they are, and the audience has plenty of time to observe Jack, the American, assess his emotional crises (using prostitutes in the past and in the present for pleasure with no commitment but finding he needs love and attachment), reflect on the possibility of his redemption (becoming friendly with the local parish priest and discussing sin, confession and atonement). The screenplay has been written by Rowan Joffe who went on to write the screenplay for and direct a new version of Grahame Greene’s Brighton Rock. This doesn’t seem surprising given the Greene-like character of the American (a burnt-out case) and his Greene-like conversations with the priest. The film has been directed by Dutch photographer, Anton Corbijn, who directed the film about Ian Curtis and the band, Joy Division, Control. The film is most attractive and photogenic. With opening settings in snow-clad Swedish forests, some sequences in busy Rome but most of the film’s action taking place in the Abbruzzi, the audience will feel that they have spent time in the mountain towns and got to know the countryside and the feel of the place. Corbijn must be a fan of Abbas Kierostami since he has even more shots, long distance, of cars travelling the mountain roads than Kierostami has of cars on and over the mountains of Iran. And the star is George Clooney. This is a very serious role and played with seriousness and an interior intensity that Clooney and the director communicate with some dialogue but more with silent, almost inexpressive close-ups which nevertheless invite us to ponder what is going on inside Jack’s head. This is especially true of the final sequence in the car where we understand, without a word being spoken, the crisis for Jack. Fans of Clooney who want fast-paced action from him will be disappointed, despite the expertise Corbijn brings to some violent events, and perhaps neglect the strong performance the star is giving. The supporting cast consists of European actors rather than names. Violante Placido brings a powerful sensuality to the role of the prostitute, Clara. And Paolo Bonicelli shows how an elderly priest can be pastoral despite his own limitations (more than a touch of the Morris West Italian novels here). The American may be best served by being labelled an Art-house introspective psychological thriller. 1. Spy and assassins? The different kinds of assassin and agent? A film of stillness, quiet, introspection? 2. The title, generic, anonymity? 3. The Swedish landscapes, frozen lakes and snow, forests? The busy city? Rome? Italy, the Abbruzzi, the beauty, the forests? The time? The musical score? 4. Genre and the usual conventions of the spy story, coming in from the cold, variety of jobs, authorities, retirement, danger, disillusionment? 5. George Clooney as an icon, his career as an agent, involved yet detached? In Sweden, the relationship, assassination attempt? The death of the assassins, the death of his lover? violence, the deaths, the effect on him, escape from Sweden? 6. Going to Italy, involved in Rome, the city? The mountains, the beauty, living anonymously,, the authorities finding him? The commission of the gun? The Belgian and her influence, the commission? The prostitute, her personality and character, and involvement with Jack? His life, his work with the gun? 7. The betrayal, the Belgian women, the attempt on his life, her taking the rifle, her own death? The authorities wanting him out of the way? 8. The local colour, the significance of Jack’s discussions with the priest, sin, guilt, redemption, theology and spirituality? 10. The attack, Jack and Clara and the relationship, her exotic beauty, the attempt to escape? 11. Jack, wounded, dying, the end of an era? 12. Reflective film rather than an action film about killers, assassins, their active life, their interior life?